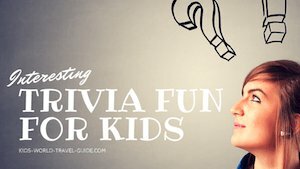 Here are some interesting Ethiopia facts which were chosen and researched by kids especially for kids. Name: Ethiopia. The name is said to come from the the founder of Aksum. 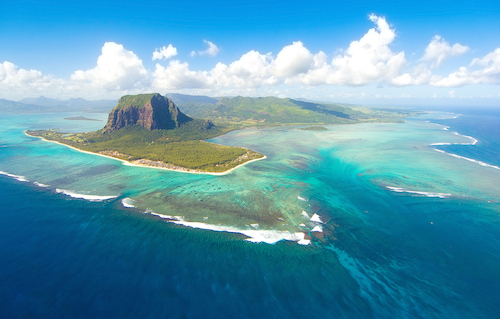 The country was referred to as Abyssinia previously. History: Ethiopia is the oldest independent country in Africa and the only African country that evaded colonial rule. For five years from 1936 - 1941, Ethiopia was occupied by Italian forces. The country was ruled as a socialist state by a Military junta from 1974 - 1991. Only in 1994, Ethiopia adopted a constitution and the first elections with participation of several parties took place in 1995. On the map you can see the neighbouring countries and the central location of the country's capital city Addis Ababa. Ethiopia is a 4 hours flight from Dubai and 8 hours flight from London/UK, 15.5 hours flight from New York/USA. 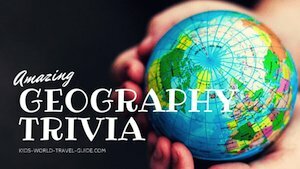 Ethiopia is roughly twice as big as Texas/USA or five times the size of the UK. 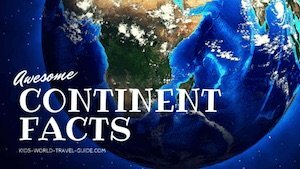 The country entirely lies within the tropical latitudes, thus the lowlands have tropical savannah or desert climate while the higher mountain plateau experiences a more temperate climate. 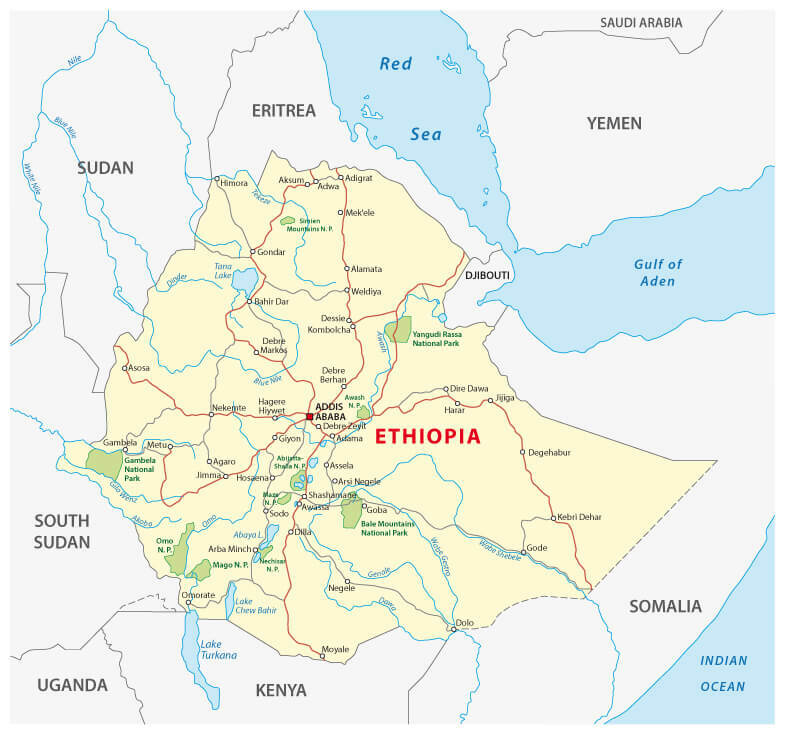 Some more Ethiopian geography facts:The country partly lies on a high plateau with a central mountain range and is divided by the Great Rift Valley. Ethiopia's highest point is Mount Ras Dashen, with 4 533m or 14 872ft. Mount Dashen is also one of the highest mountains in Africa. Ethiopia's longest river is the Blue Nile (which is called Abay in Ethiopia). The river has a length of 2 574m or 8 444ft and originates in Lake Tana. Ethiopia's largest inland lake is Lake Tana. 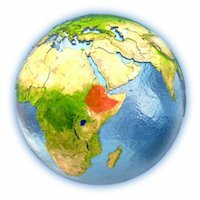 Ethiopia is not only the second most populous country in Africa but also the most populous landlocked country in the world! 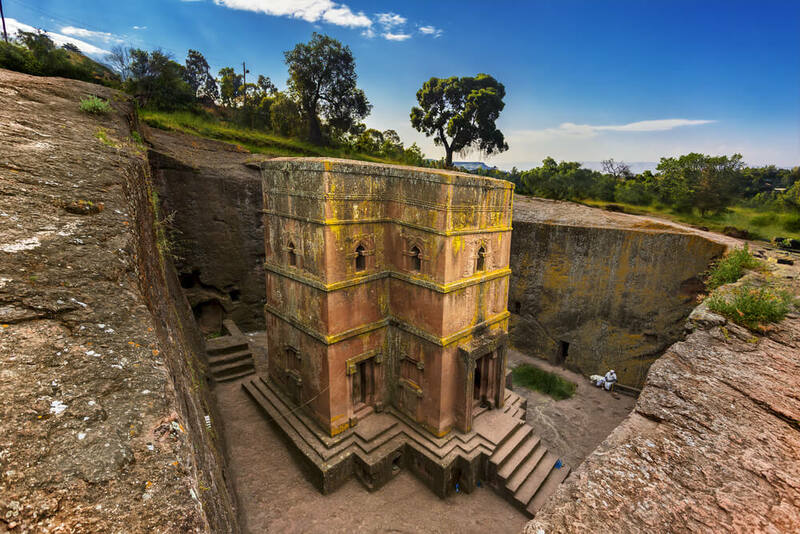 There are eight UNESCO world heritage site in Ethiopia with Simien National Park and the Lalibela Rock-Hewn Churches the oldest acknowledged heritage sites in the country. See here. Lalibela: The rock-hewn churches are probably the best known attraction of Ethiopia. Here eleven medieval churches were cut and carved out of rock. 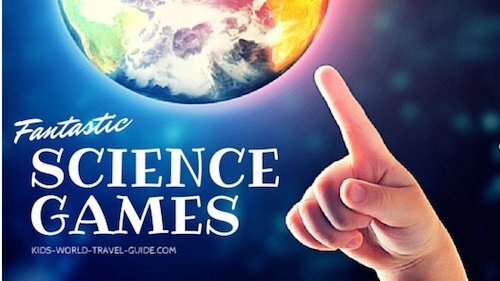 It is said they were built under King Lalibela who called them 'New Jerusalem' as at that time in the 12th century the Muslims had stopped the Christians from their pilgrimage to the holy land. Addis Ababa: Ethiopia's capital is a quickly growing city and the country's largest city and main commercial centre. Here they say you also find the world's largest market, called merkato. 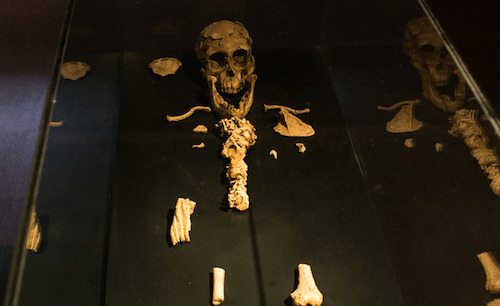 In Addis Ababa you must visit the National Museum, where there are the world's oldest fossils of a hominid: Lucy, in Amharic called Dinkinesh. The bones were discovered in Ethiopia in 1974 and are thought to be 3.2 million years old. 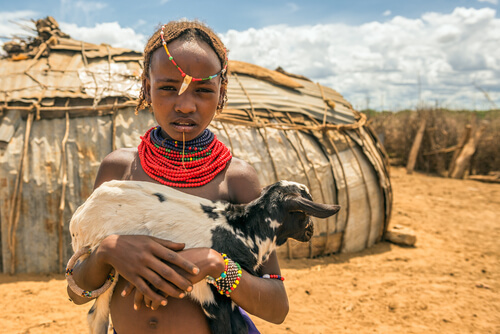 Omo Valley is home to several indigenous groups where traditions are upheld. 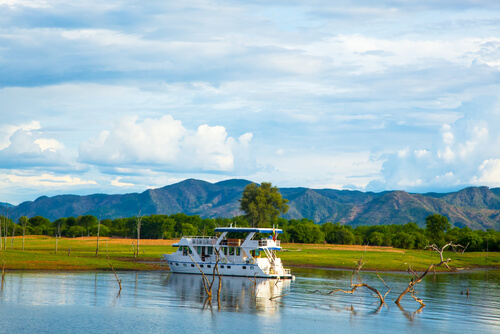 The Omo River basin is one of the UNESCO world heritage sites due to fossil and tool finds that date more than 2.4 billion years! 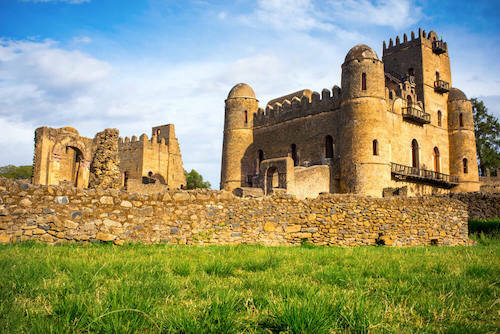 Gondar Castle: This building is also called Fasilides Castle as it was built by Emperor Fasilides in the 17th century. Gondar was then an important agricultural and trade centre in Ethiopia. 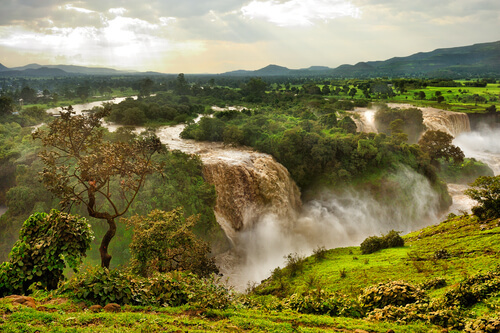 The Blue Nile Falls is one of Ethiopia's big attractions and are a must visit when in Bahir Dar, one of Ethiopia's biggest cities. 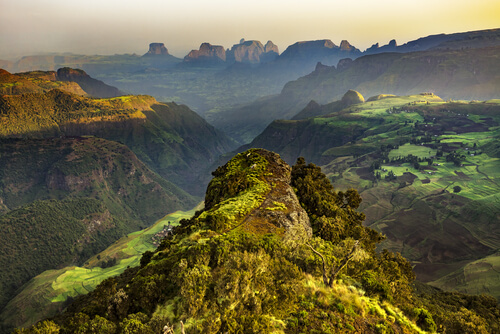 Simien Mountain National Park: This national park in northern Ethiopia offers breathtaking views of the highland landscape. The plateau with mountain peaks up to 3 600m/11 800ft. are quite a contrast to the much lower escarpment as there are steep cliffs and canyon-like gorges. Ethiopia is one of the poorest countries in the world, but is also one of the promising countries due to changes in the country's leadership and efforts to combat poverty and increase the education levels in the country. The economy in Ethiopia is mainly driven by agriculture and fisheries due to the favourable climate in many regions and the many rivers of the country. 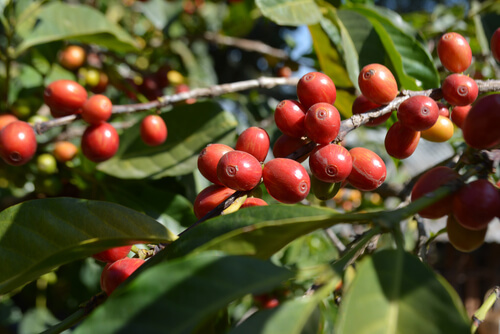 Coffee is the biggest export product of Ethiopia. Other exports include oilseeds, vegetables and gold. The main export partners are Sudan, Switzerland and China. Mining plays a role in Ethiopia as well. The main resources are gold and tantalum, a metal which is used in electronics. Rock salt is mined as well as is marble. 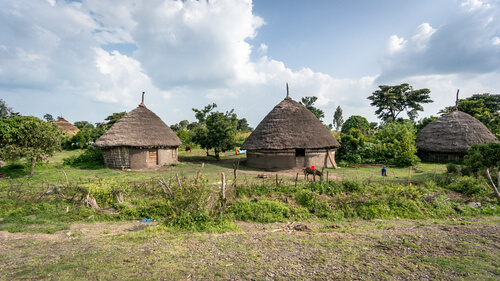 The energy used in Ethiopia is firewood and charcoal, but more and more also hydroelectric power stations are built which however also threaten the homes and traditional lifestyle of the rural people. 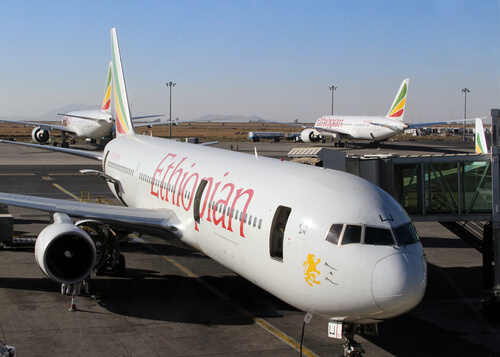 Did you know that Ethiopian airlines are the largest African airlines? The major cities in Ethiopia are Addis Ababa, Dire Dawa, Mek'ele, Gondar and Bahir Dar. Ethiopia is the second most populous country in Africa - after Nigeria. Most people live in the highlands in the northern and western parts of the country. Ethiopia was affected severely by drought and famine in recent years. In 2016 Ethiopia experienced the worst drought in 30 years and many people fled from the affected areas. Only one in five Ethiopians live in urban areas, such as the capital city or in larger towns. Most people live in rural areas and work in agriculture. 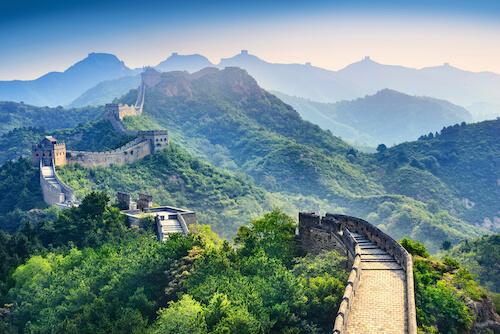 The eastern parts of the country are only sparsely populated. 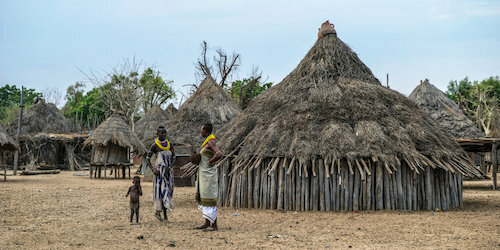 In rural areas many people live in traditional huts. Ethiopians are very religious people and most of them practise their religion regularly. 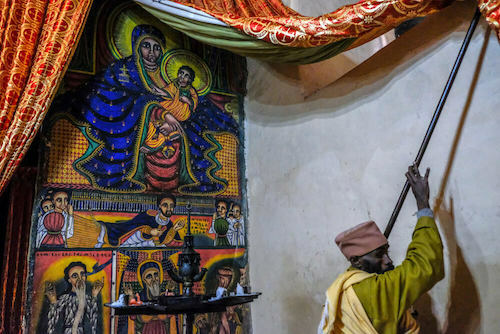 More than half of the population are Christians and mostly follow the Ethiopian Orthodox Church which is one of the oldest Christian churches in the world. Although not as dominant in Ethiopia, more than a third of the population follows the Islam teachings. The vast majority of Muslims live in the eastern lowlands of the country while most Christians live in the northern highlands but their influence is more obvious countrywide. Ethiopia has one of the highest birth rates in the world. 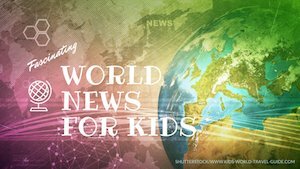 On average a woman gives birth to five children. The country thus a very young population. 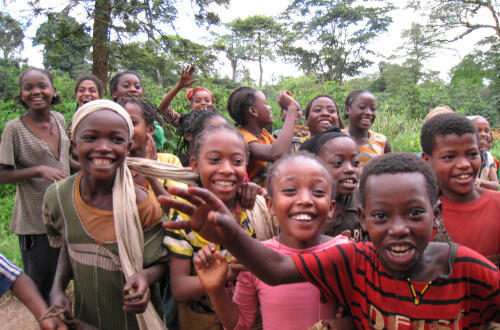 More than 40% of all Ethiopians are under 15 years old. The average life expectancy is about 50 years and only one in 20 people of the population are older than 50 years! Only 4 out of 10 children between 7 and 12 years attend school! When living in a bigger city, children usually get a much better education as there most children go to school. However, in rural areas children are less likely to go to school or even get a secondary education after primary school. In cities about 20% of all children aged 12 - 18 attend a secondary school, in rural areas only 2%. In fact, 28% of Ethiopian men and 41% of all Ethiopian women who are 15 - 19 years old, never went to school! Only 50% of the population can read and write properly. While one in 25 people in Ethiopia is overweight or obese, however, one in four children under the age of 5 years is underweight! Healthcare is scarce in Ethiopia, as there are only three doctors for 100,000 people. In the USA and Europe, there are about 400 doctors for the same amount of people! 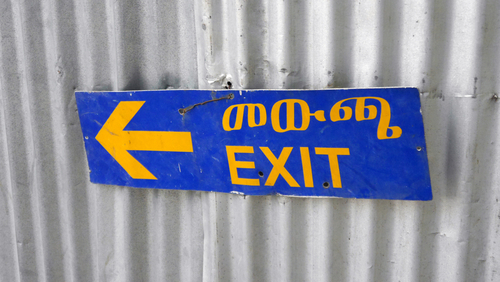 Amharic is the main working language in Ethiopia, as there is no official language. 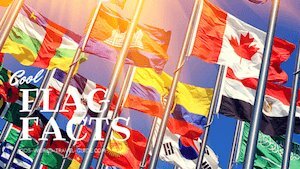 More than 80 languages are spoken in Ethiopia! Local languages are taught in schools and also used in official communications. Amharic, Oromo and Somali are the most widely used local languages. English is taught as first foreign language in schools. However, many people do not only speak their local language, but also English, French and Arabic are widely spoken. This is from Article 1 of the Universal Declaration of Human Rights. 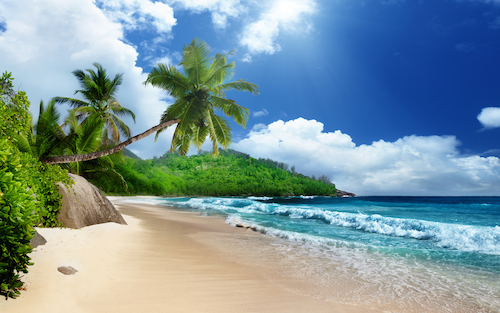 The example is from this site: Click here. Coffee, beans, oilseeds, sugar cane, corn and cereals are the main agricultural products in the Ethiopia. 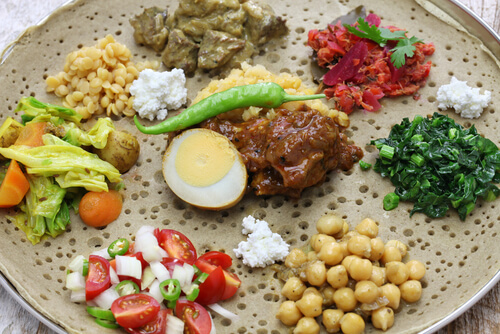 Ethiopian main dishes contain vegetables and spicy meat stews and sauces - and flatbread which is called injera. Pulses such as lentils or chickpeas, beans or corn are common in dishes as is beef, lamb and fish. For religious reasons, pork is not eaten in Ethiopia. 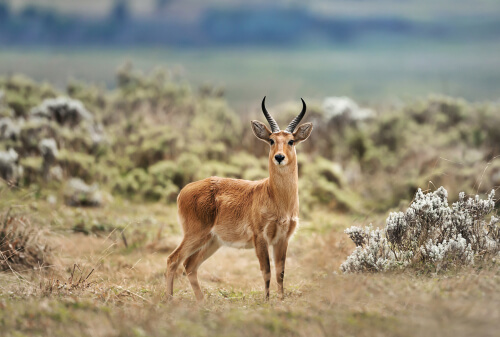 Ethiopia is home to many rare and endangered animals and plants. 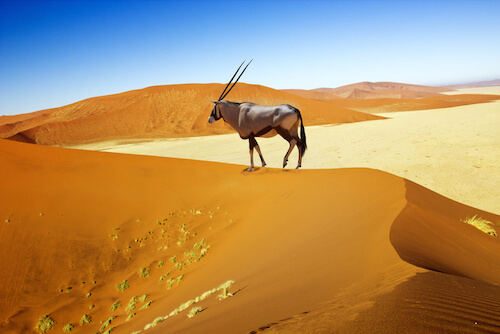 Unique to Ethiopia are the mountain nyala and the Simien jackal. 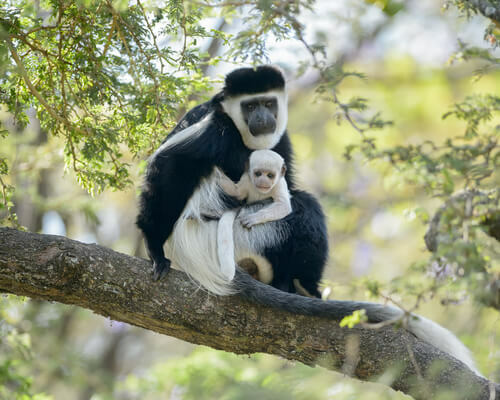 The country is also known for its communities of black and white colobus monkeys and the gelada baboons. In the lowlands many antelope species, wild pigs and monkeys roam freely. 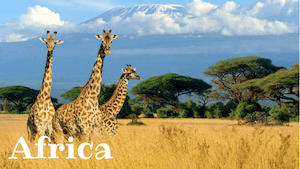 In Ethiopia there are more than 20 national parks and game reserves where animals are protected. 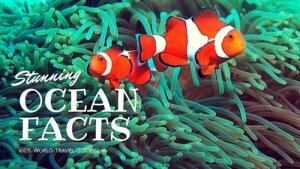 Ethiopia Facts: Did you know…? Abiy Ahmed is the Prime Minister or Head of State of Ethiopia since April 2018. The Chief of State or President of Ethiopia is Zewde Sahle-Work, who is the only female president in Africa! She was voted by parliament unanimously in October 2018. The African Union has its headquarters in Addis Ababa. Image Credits on Ethiopia Facts: Oscar Espinosa/shutterstock.com and other photo stock from shutterstock and wikicommons, if not otherwise stated. We hope you enjoyed reading our Ethiopia Facts. 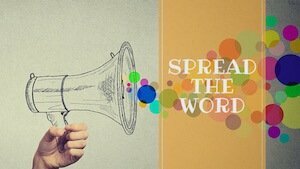 Please bookmark this page and spread the word. We will add more information in the near future as we still have to sort through our images and stories from our recent travels.